Read about our history and development as we look back on 100 years (April 1915-April 2015) of accomplishments and hard work, learning from the work that has gone before and reaffirming our undiminished commitment to enduring peace with justice and freedom. 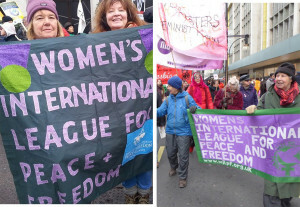 WILPF and Clapham Film Unit submitted an entry to the Women’s History Network Community History Prize for our work on the “These Dangerous Women” project. We were very pleased to be awarded a Highly Commended Certificate.